Infanticide and cannibalism are two extreme behaviors seen in primates. Though extreme, the persistence of these behaviors in primates suggest that they are adapted for and had evolved to serve different purposes. Infanticide and cannibalism can be considered as both reproductive and survival strategies. Infanticide has always been associated with males killing off the progeny of former dominant males to make females more sexually receptive and to shorten the birth interval. Cannibalism, on the other hand, is not as sinister as it has always portrayed to be but just a coping mechanism. Ingestion of body parts, usually own offspring, is a response to cope with food scarcity. Lack of food resources would inevitably result in the death of the offspring thus cannibalization returns the caloric investment back into the mother. A new paper by Culot et al. (2011) has documented a case of infanticide and cannibalism in a wild female moustached tamarin (Saguinus mystax). Moustached Tamarin (S. mystax) from The Bronx Zoo, New York City. Photo from Wikipedia. S. mystax belong to the Callitrichid family, and like all Callitrichids has an interesting reproductive strategy unlike those of other primate families. Callitrichids form multimale-multifemale group and has a polyandrous (one female, multiple male) mating system. 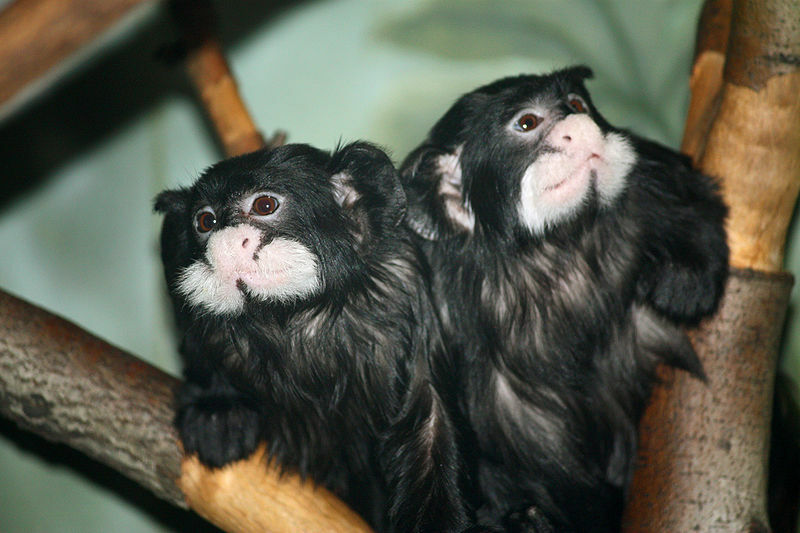 Callitrichids are the only primate family that consistently give birth to twins. The gestation period for S. mystax is 6 months. Usually, only one dominant female is reproductively active and shares offspring rearing responsibilities with multiple males in the group. However, an unstable dominance hierarchy among females might lead to multiple births within the group and will compromise the survivability of both the group and the offspring from stress, less parental investment and lack of food resources. The researchers were studying how help from male moustached tamarins in the same group and the absence of female competition ensure the survival of offspring when they observed a female cannibalizing an infant. Necropsy and genetic analyses were used to rule out diseases and to determine paternity. They found that the infant has no diseases and did not die from trauma (falling from tree). Instead, it was a healthy infant and was being cannibalized by its own mother. The mother was seen biting and then eating the head of its own infant during a period when another female was pregnant and gave birth just 1 month later. Before that, the perpetrator had given birth to twins three times successfully when four to five adult and subadult males were present in the group. Although we do not know for certain that the infant was alive when the mother started biting it, our field observations preceding the event suggest it probably was. The possible infanticide case and the two cases of births and early death of the infants occurred while only two to three adult males were present in the group. This could be the second case of maternal infanticide reported in the genus Saguinus and the similar circumstances suggest a common pattern. Culot et al. (2011). Five common hypotheses proposed by Hrdy (1979) were used by the authors to try to explain maternal infanticide and cannibalism in this scenario. These hypotheses are resource competition, sexual selection, social pathology, exploitation, and parental manipulation. The resource competition and sexual selection hypotheses were rejected because it was maternal infanticide, and not infanticide from another female. The social pathology hypothesis was rejected because it predicts infanticide restricted in areas that are disturbed by humans. The study group was habituated and had many successful births, therefore social pathology was ruled out. The exploitation hypothesis was also reject because the mother did not kill her infant to exploit its meat. Observation shows that the mother only consumed the brain and parts of the infant’s neck. The parental manipulation hypothesis was accepted because the authors think that it best explains the scenario. The offspring was not pathological nor did it fell from the tree. Instead, it was a healthy infant that was killed by its own mother. According to Hrdy (1979), victim of parental manipulation does not necessarily have to be defective but also born “at the wrong place in the wrong time”. The authors concluded that parental manipulation is the best explanation for this possible maternal infanticide scenario. Parental manipulation strategy can happen in a group with poor capacity to raise the offspring from multiple breeding females, birth intervals that are shorter than 3 months, and low infant survival probability due to physical injuries or weakness. Culot, L. Lledo-Ferrer, Y. Hoelscher, O. Lazo, FJJM. Huynen, C. Heymann EW. 2011. Reproductive failure, possible maternal infanticide, and cannibalism in wild moustached tamarins, Saguinus mystax. Primates 52(2): 179-186. Hrdy, SB. 1979. Infanticide among animals: A review, classification, and examination of the implications for the reproductive strategies of females. Ethology and Sociobiology 1(1): 13-40. Good job, Raymond! Primate news seems to be slim pickings at the moment. Interesting article. When I was in school I did a project using mice and how they reacted to being crowded and the two most obvious reactions was gang rapes and new mothers eating all their offspring. My prof suggested that the cannabilism was probably a result of the female trying to curb the growth in the group rather than putting them back is heat. Then we started cutting back on food which caused older males to kill and eat younger males and females to not only eat their own young but raid other female nests. I think about that project often as I get older and see our social behavior detoriating. I wonder if we’re (Earth) under a big microscope sometimes and who’s watching us.